​Thiago Rocha is a Master's degree candidate in Law and Legal Science, Specialization in Fundamental Rights, at the University of Lisbon School of Law. Researcher in mobility for the Erasmus+ program at the Master in Legal Protection of Vulnerable People and Groups, University of Oviedo (2017/2018). 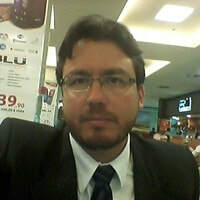 He holds a law degree from the Federal University of Uberlândia (2005), Post-Graduation in Public Law (2009) and Post-Graduation in Social Rights (2015). He develops academic research in the areas of fundamental rights, human rights, democracy and citizenship, with emphasis on the legal analysis of social minimum and Universal Basic Income. He has published chapters in books and articles in journals, made communications, and also participated in organizing committees in scientific congresses in Brazil, Spain and Portugal. In those countries, he actively participates in discussion groups and activities on Universal Basic Income. He is currently an advisor on fundamental rights to the Ibero-American Institute of Legal Studies – IBEROJUR. Thiago has also practical experience in the area of ​​Public Law, with emphasis in Constitutional Law and Administrative Law, having provided services to Ernst & Young (2010 to 2017), National Confederation of Municipalities – CNM/Brazil (2008 to 2010) and PricewaterhouseCoopers (2005 to 2008). 2017: Renda Básica de Cidadania: a não regulamentação da Lei n. 10.835/2004 sob a perspectiva do controle de constitucionalidade In: I Congresso Ibero-Americano de Intervenção Social - Cidadania e Direitos Humanos.1 ed. Carviçais: Lema D'Origem, 2017, v.1, p. 103-115. ISBN: 978-989-8890-01-6. 2018: O papel do mínimo social ante a cláusula da reserva do possível no controle de constitucionalidade brasileiro In: Giustizia e Costituzione agli albori del XXI Secolo. 2 ed. Bologna: Bonomo Editore, v.1, p. 387-394. ISBN 9788869720611. 2017: Mínimo social, autonomia e participação democrática, In: Pensar a Democracia. Prefácio de Noam Chomsky. Charleston: CreateSpace Independent Publishing, ISBN 10: 1548350958 e ISBN 13: 978-1548350956, p. 151-164. 2017:​ Os deveres impostos pelo direito humano a um nível adequado de vida, In: Revista do Direito de Língua Portuguesa. Ano V, Número 9, Jan-Jun/2017, Lisboa: IDiLP, ISSN 2182-8695, p. 285-300. 2017: O mínimo existencial na jurisprudência do Supremo Tribunal Federal In: Paradigmas do Direito Constitucional Atual. 1 ed. Barcelos: Instituto Politécnico do Cávado e do Ave, 2017, p. 313-323. ISBN: 9789899986121​. 2016: A pobreza como elemento da globalização hegemônica neoliberal. In: Dimensões dos Direitos Humanos. 1 ed. Porto: Universidade Portucalense Infante Dom Henrique, v.1, p. 495-507. ISBN: 978-972-9354-45-8. 2016/2018: “Renda Básica de Cidadania como direito fundamental concretizador do princípio da dignidade da pessoa humana no Estado Brasileiro”. Master in Fundamental Rights of the University of Lisbon School of Law.